IMS™ Problem Investigator for z/OS® is a log analysis tool for all IMS problem determination tasks. With IMS Problem Investigator, the flow of events inside IMS becomes clear. Track the transaction life cycle through IMS and IMS Connect. See transaction times, event latencies, response codes and more. Detect issues on the database side of IMS by revealing critical information, such as who updated a database, when the database was updated and how to reverse the changes. Diagnose performance issues on the transaction management side of IMS by tracking transactions end to end. Use IMS Problem Investigator to determine where bottlenecks are occurring. Find the problem faster, more reliably and with greater confidence. You are able to select log files for report and extract processing, as well as rapidly drill down to the root cause of a problem. Learn more about how IMS works from the inside and take the guesswork out of program debugging. 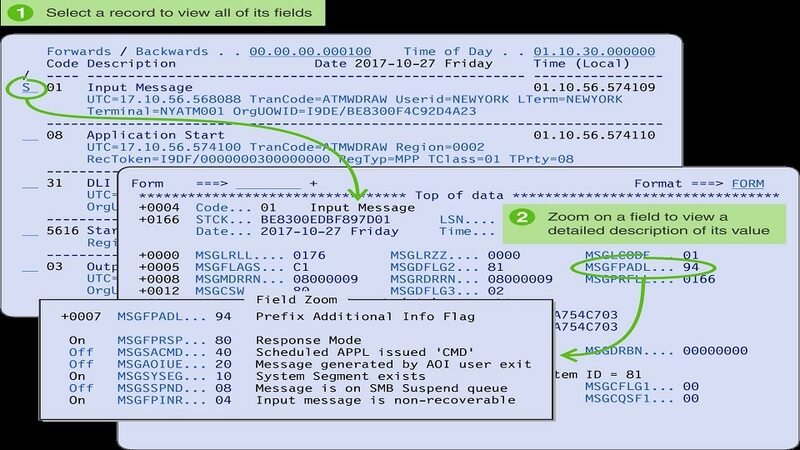 Replay the entire IMS transaction from end to end in a single product, from a single screen – Db2® and MQ events included.